A Room with a View is primarily designed for individual Couples seeking some tranquil indulgence. Extensive floor-to-ceiling windows take full advantage of the amazing view - a sweeping valley that frames a huge ocean expanse and a sky which is a feature in itself - see our web -site roomwithaview . com . au. for more details and menu options and a more detailed Availability Calendar ie suite or studio. This B&B accommodation is NOT suitable for families - we have 2 studios & one 2storey suite. The studios contain a queensize bed the 2 story suite has a split king which can offer twin accommodation. All rooms have a sofa, tv, dvd, cd player, electric panel heater, ceiling fans, an ensuite bathroom with twin spa, basic kitchenette ( NO oven or hotplates ) and private balcony. We can provide a rollaway bed for third person but our accommodation is not suitable for young children (children between 6mths - 10years are not permitted in the 2storey suite at anytime). A complimentary basket of assorted cereals is provided in all rooms along with milk, tea, coffee, sugar, salt & pepper. Fully cooked breakfasts such as Berry Pancakes, English Breakfast, Fruit Risotto, Herb Omelettes etc etc may also be offered. While we are Pet Friendly - it is on a conditional basis by prior arrangement only. Our usual latest check-out time of 11am applies on all days except SATURDAY when an earlier time of 10am is required. Check-in time is always any time after 2pm. While we normally have a two night minimum - single nights will be considered if you contact us directly, especially off-peak midweek. We are 14kms east of Apollo Bay - extremely central to most local attractions. Most waterfalls are within 35mins driving time, the closest are approx 8mins. There are several wineries in the hinterland within an hours drive and the 12 Apostles are approx 1.5hrs away. Secluded beaches are to be found at the base of our road - 2.8kms. Apollo Bay which is only a 15mins drive away, offers many cosmopolitan delights such as excellent cafes, restaurants and interesting shops. Voted in 14th place out of 101 best places to stay in RACV campaign in 18 Oct 09 Herald/Sun - see comments on 101Victoria page of RACV website. Dear Angelika - this is "one out of the box" - when you travel as much as I do - to come home to this is Bliss!! "EM Forster eat your heart out." "'A Vision Splendid' - with outlooks like these, everything else is a bonus." Liza Power from THE AGE. Thank you Angelika for an awesome stay. You have made two queens from the city feel like Kings of the World! Well, what do you say. As a travel agent I've seen and been to so many places around the world, who would have known one of the most spectacular views is only 2.5hrs drive from home. Thanks Angelika, It's been a great short getaway. The view was spectacular. The food sublime and the welcome, warm. We loved our stay and we’re thrilled at how beautifully clean the room was. It was a lovely weekend and we can’t wait to stay again. Wholeheartedly recommend. Amazing view! Lovely accomodation we will be back!! Absolutely stunning view, really comfy, wildlife galore and our hosts were amazing. I can’t really fault this place; location is great, the view is expansive and by far the best part of this place, the ammeneties are ok, bed was comfy and the spa nice for one person. Angelika was nice enough to bring us some croissants for breakfast on our last day and wowsers were they good!! If there was anything that could have improved our experience it would be WiFi. The location is remote, so meant no phone reception. In today’s day and age I think WiFi is a must for remote locations. Especially if you’re trying to look at maps and google things. It was a pleasure to have you and Natasha stay with us and am pleased you would consider returning. It is indeed a shame that telcos neglect internet services for country areas however while limited to the southern side of our rooms we get reception from Optus, Vodafone and especially Telstra. All our guests are given free access to wifi in our office to send emails or basic internet searches, available on request. We loved our stay at " A room with a view". 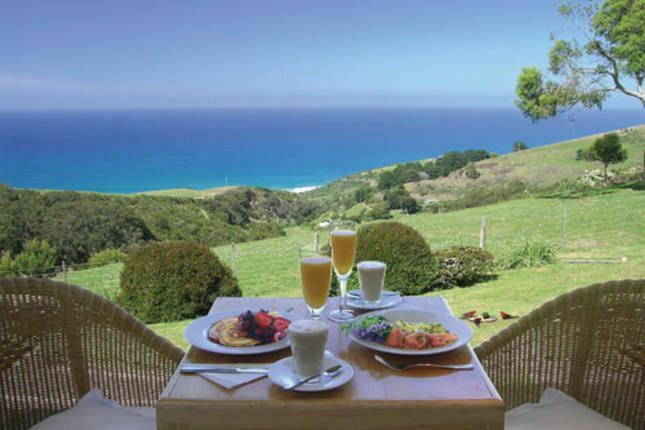 Peaceful and lovely location with the wonderful relaxing view of the hills and ocean. Great location near lots of walks and waterfalls. A gem. Expansive ocean views and wonderful bird life. We thoroughly recommend this place.